The Global Chief Executive Officer of Royal FrieslandCampina, makers of premium dairy products including Peak Milk, Hein Schumacher has disclosed that the fresh €23 million investment in local milk production will among other things; transform additional 500 pastoralists to settled dairy farmers. The scheme tagged Dairy Development Programme (DDP) announced by Schumacher in Nigeria will continue to improve on “Working with 3,500 dairy farmers in over 90 farming communities in Oyo State”. He said his company is already providing the required knowledge transfer and sustainable livelihoods for their host communities. 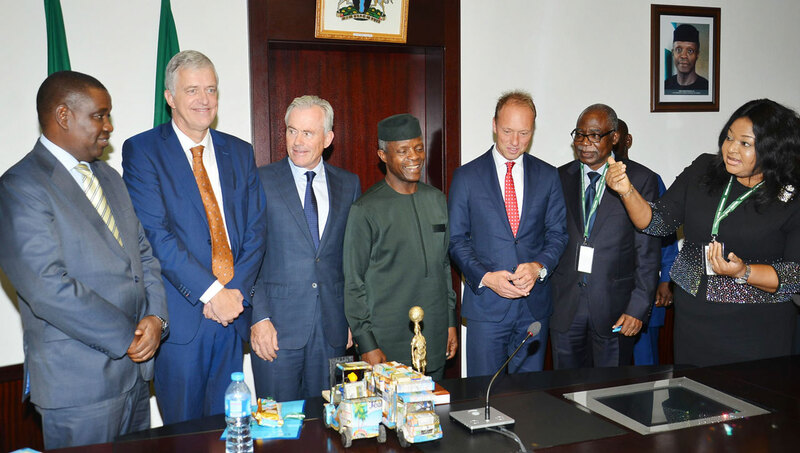 Explaining more to journalists at the State House after meeting with the presidency, Schumacher said “The Vice President, Prof Yemi Osinbajo asked us to continue to invest in local dairy farming to increase local production of milk, and we are fully aligned with his request. We will take forward the programmes we have been running and expand them.”“We are investing around €23 million in our evaporated milk and ready-to-drink milk factory in order to provide fresh milk for the Nigerian consumer. “FrieslandCampina WAMCO has been successful with dairy development in recent years and milk yield is improving,” Schumacher said.